About thousand people took part in the march that started at the monument of Stephan Bandera (the Galician nationalist leader of the WW2 period, who is considered a war criminal in Poland and other countries for being responsible for the Volhynia genocide). The participants were chanting slogans like "Ukraine above all" (a variation of "Deutschland über alles"), "Division Galicia - heroes of Ukraine," "Foreigner, remember that Ukrainians are the lords here," "Bandera, Shukhevich - heroes of Ukraine". A Twitter user named Friendlybus commented on this banner: "They are holding banners with Arne Funke, SS soldier posing in front of the burning M8 Greyhound of US Army in Ardennes. Do they have any respect for those allies who died in WW2?" I had no clue what he meant by that, so I did a little Internet search. I found that the soldier in the photo on the banner is apparently used by today's neo-Nazis as an iconic SS-man, a representative of the superior German race! Both in the English-language and Russian-language Internet. His photos were made by a Nazi propaganda film crew after a temporarily successful SS offensive in Ardennes on December 18, 1944. His name, besides Arne/Arno Funke, is also variously given as Heinrich Severloh, Walter Armbrusch, or Johann "Hans" Tragarsky, and his photos show the same person as in the banner above! In the middle of that page are photos where he and his fellow soldiers are smoking Camel cigarettes taken from the American troops. He is being called "a guardian angel for Germany" there, and there are also quite a few positive/admiring comments on this person and the Nazi cause in other related pages. An example of a Russian-language page with the same photos. One can also find on that page links to a 9-minute captured German movie with English voice-over made on the same date. Starting from about 4th minute, one can recognize the same soldiers, smoking cigarettes robbed from the American dead. I do not understand why these extremist Ukrainian nationalists are not worried about showing publicly their neo-Nazi leanings. 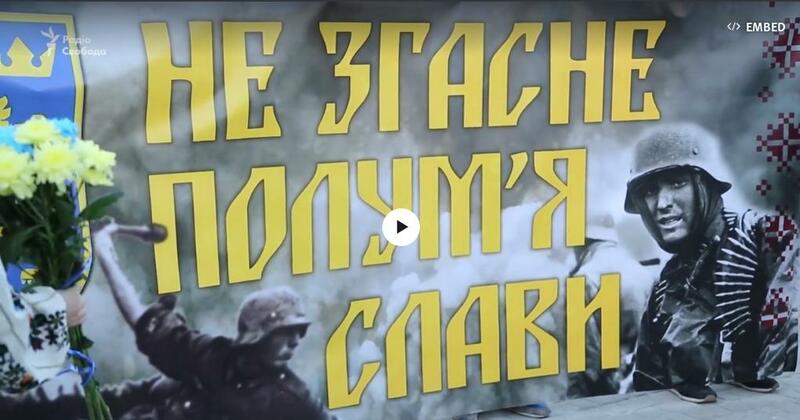 The Ukrainian army is dependent on US (and Canadian) financial support and military training, and they are celebrating a symbol of what the allies fought against during WW2 (who moreover had no relation to Ukraine)!? And why are the western governments looking the other way? These extremists are a minority in Ukraine, but they are not afraid to use violence, and the police is afraid of them. They played the main role in the coup d'etat of February 2014. And so they may feel indispensable in maintaining the new order, they think they are above the law. They are intimidating courts when not happy with a court decision. They are trying to force their views/standards on the rest of the population, and must have some protection in the ruling structures. They definitely do not tolerate dissenting views. E.g., just last month, activists of this kind burnt down a Roma encampment in Kiev (and police did not do anything about it because it did not get any complaints from the victimized Roma!). Or last fall they vandalized the facade of a furniture store in the centre of Kiev after its owner allegedly painted over the graffiti left on its facade since the 2013/2014 Euromaidan. In this case police at least arrived at the scene after some time, and was able to prevent the spreading of the fire. But the owner of the store was the first one to be charged, directly by the Prosecutor General, with vandalism for removing the graffiti considered a monument to the 2014 revolution - in spite of that he apologized claiming that a stranger removed the graffiti in order to frame him. Moreover, Prosecutor General ordered to send all kinds of government inspectors to this store to see if the owner could be punished even more. The act of defacing this facade was advertised well ahead, and thus performed in front of dozens of media cameras, and most of the Ukrainian media were cheering and approving it!. In social media, the comments on both of these two mini-pogroms were divided, some approving them, and some were condemning them - asking that that law is upheld and that conflicts are finally, after four years of violence, solved by discussion and compromising. The raking of Kiev in the Global Livability Index fell the most of all the ranked cities in the last 5 years, and in 2017 ended up in place 131 out of 140.